With tomatoes and peppers ubiquitous in vegetable gardens, eggplants are often the nightshade left out. But even if your summers are on the cool side or the short side, you too can have homegrown eggplants. On our farm in central Virginia, shorter season varieties are often our best performing when summer is unusually cool or wet, and their faster-maturing fruits are the first to arrive at the table. 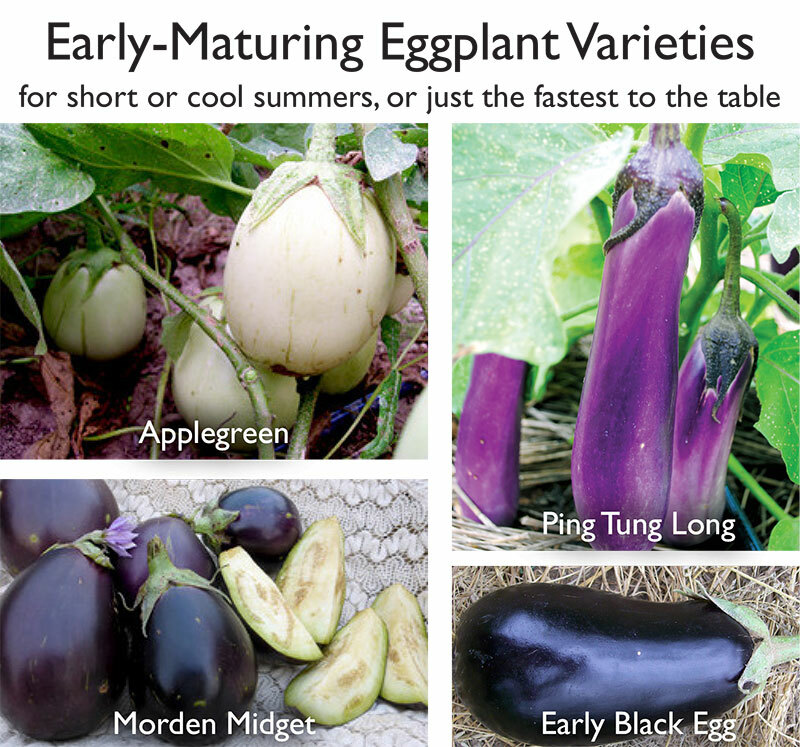 Southern Exposure sells four early-maturing eggplants: Applegreen (65 days, green-white skin), Early Black Egg (65 days, Japanese origin, deep-purple skin), Morden Midget (65 days, Canadian origin, deep-purple skin), and Ping Tung Long (62 days, Taiwanese origin, lavender skin). I’m partial to long skinny eggplants (I like chopping them into thin half-moons), so Ping Tung Long is my favorite. I find that Asian varieties substitute well in Italian and European recipes. The lavender skins darken with cooking to a purple-tan color. 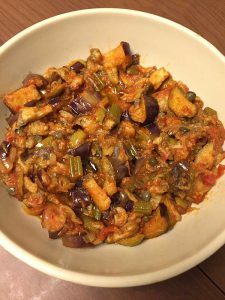 My current favorite eggplant recipe follows: a Sicilian Caponata. Caponata is vegan and gluten-free, and so full of flavor that no one will notice. Adapted from David Lebovitz’s blog. Lebovitz requires deep-frying the eggplant in batches. This oven-roasted version cuts the oil somewhat, and is so much easier, and I think tastes just as good. 2. Trim the stems off the eggplants, halve lengthwise, and slice into 1/2-inch pieces (half-moons work well for long-types, otherwise 1/2 inch cubes). 3. 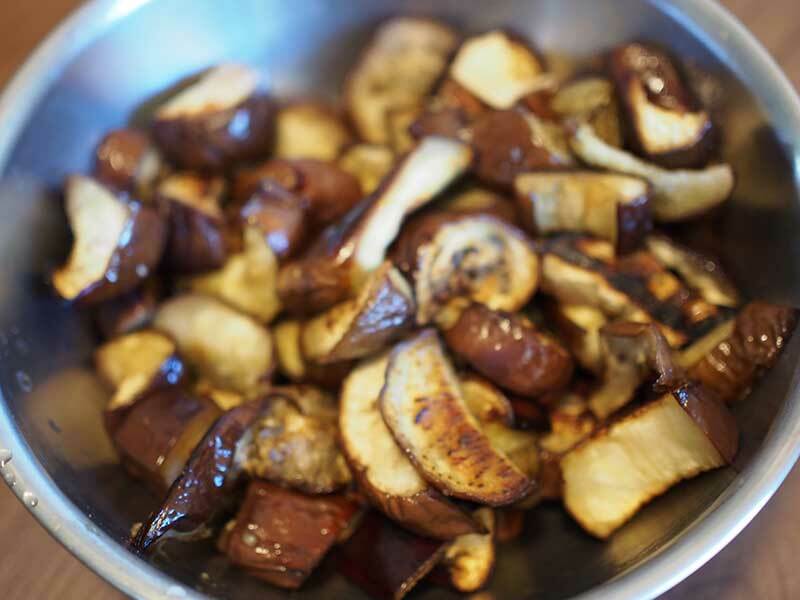 Toss the eggplant pieces with 1/2 to 1 tsp salt and 1/4 to 1/2 cup olive oil (it will soak up quite a lot). Spread on a baking dish and cook for 30-45 minutes, until the eggplant pieces are soft (easily pierced with a fork) and the skins have begun to darken. 1. Boil a medium-size pot of water. Cut the celery stalks into 1/2-inch slices. Simmer the celery until just tender, around 7 minutes. Drain and immerse in cold water to stop the cooking. 2. In a large skillet or Dutch oven, heat 2-3 tablespoons olive oil on medium-high heat. Add the sliced onion and cook, stirring frequently until translucent, around 7 minutes. Add the drained celery, olives, capers, tomato sauce, vinegar, and honey and bring to a low boil. 3. Add the eggplant and simmer for 3 to 4 minutes, stirring gently. 4. Taste and add additional salt and vinegar as desired. Transfer to a large shallow serving bowl to cool. Serving: Allow to cool before serving, or refrigerate and serve the next day (this gives the flavors time to meld). Garnish with the chopped parsley to serve. May also be served as bruschetta — spread on bread slices that have been spread with olive oil and oven-toasted.